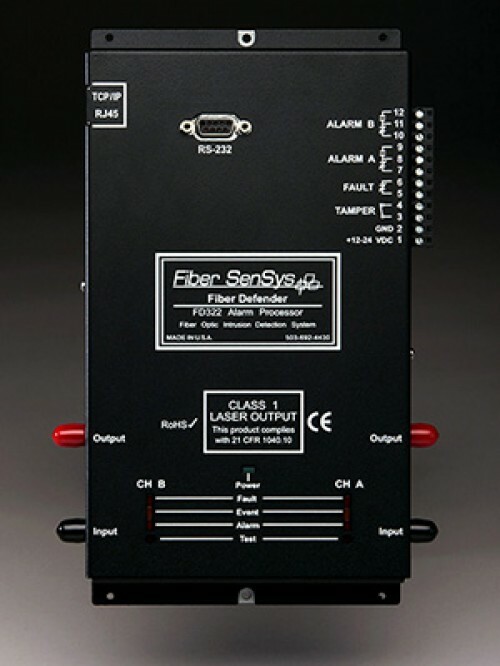 Fiber SenSys® has developed the FD322 Fiber-Optic Intrusion Detection System as an all-new fiber-optic perimeter security sensor designed specifically for price-sensitive industrial, commercial, and retail applications. Two fully independent zones, each of which can support up to 500 meters of sensing fiber. Durable fiber-optic sensor is unaffected by chemical or electrical elements in the environment including corrosion, EMI and lightning strikes. TCP/IP interface utilizing XML, in addition to an RS232 communications port, ensures high-level integration and communication options. The FD322 can be fully integrated with our Fiber Commander™ head end for a total system solution when combined with other security elements such as video cameras and other third-party devices. Includes FD322 custom tuning software.